Dennis Wu, co-founder and CPA, WuHoover & Co. LLP, excerpted from an interview with the National Museum of American History, November 18, 2015. Edited for clarity by the National Museum of American History, March 2016. I was born in the Philippines in Manila, shortly after the Second World War started. My mother’s friends would say, “Of all the times to be pregnant, why did you pick now?” as if she had some idea that the Japanese were going to attack Pearl Harbor. My father's full name was Ken Chan Wu, but friends called him K.C. He went to Manila from Southern China when he was only ten years old, leaving his mother. His father and my granduncle had gone to the Philippines earlier to find their fortune. My dad’s initial job was a server/busboy for the many Chinese men who worked in the grocery store that my grandfather and granduncle started. My father got his education in the Philippines and did very well. When I look back, my grandparents were very progressive in encouraging him to study and go to America, at the age of eighteen, for college. He was the first member of our family to leave the Philippines to come all the way to America. He chose to go to Chicago, and it probably was fate, because that is where he met my mother. My grandfather, on my mother's side, had a Chinese restaurant in Chicago, and it was the favorite hangout for the Chinese students, who were mostly boys at that time. At one point, my mother was dating three guys at the same time. My grandpa had to say, “Mae, don’t you think three is a bit much? You have to pick one.” Fortunately, my father was the one she selected. They got married and went back to the Philippines. My father was managing one of the family stores in the suburbs before the war. We had a lot of American and British customers who later were interned, imprisoned if you will, by the Japanese. My parents helped a number of the internees. They would ask my father to buy medicine and food. My mother sold all her jewelry, even her wedding ring, to help finance the purchases. It was all in trust that America would come back and save these folks and that they would pay us back when that happened. The internees would ask my dad why his purchases were one third the cost that others paid. His response was, “I don’t know but this was what I paid for them.” I learned very early that you don't take advantage of people in need. When America returned, the U.S. Army sent a special group to free the camp. The Army was looking for somebody to manage the kitchen, and they sent for my dad. My father started at the camp and hired a number of former employees he trusted to cook and take care of the internees before they returned to America. They were too weak to take care of themselves. In the beginning, the camp commander told him, “K.C., you know, we cannot allow the laborers to eat meals here.” My father’s response was, “Would you rather work out something or would you want them to start tasting the food we serve more often? You have to remember that these workers were also hungry throughout the war.” So they worked out an arrangement where they could eat what they needed. And to the extent that there were some leftovers, the workers could take it home to their families. After the war, America only allowed one hundred Chinese a year to immigrate. There was no chance that most Chinese would ever be able to immigrate to America. But our friends, the former internees, pushed for a private bill through Congress for our family to immigrate because of my father's assistance to the American internees during the war. So in 1952, we came here to San Francisco, and we lived in Berkeley. We actually bought a home-the first home that our family owned, because in the Philippines you are not allowed to own property. At first, my mom was very frustrated and did not like the areas where the relators agreed to sell to non-whites. Finally there was a house in the Berkeley hills and mom fell in love with it. Of course, we were told, “You cannot buy this house.” The house was owned by the Methodist Church, and they were selling it. My dad was a Deacon in the Methodist Church in Manila, so he met with the Bishop in San Francisco and said, “Well, it's very, very simple. You just take the house back from the real estate agent, and you sell it to me. After all, when you were in Manila not so long ago, you were preaching brotherhood and that we are all equal in the eyes of God.” So that's what happened; the church took the property back, and they sold the house to us. As the word got out that a Chinese family was going to be buying the house, one of our future neighbors circulated a petition around the neighborhood against our buying the house. After we moved in, this individual came up to my dad, after he learned that my dad was a Mason, and they did their secret handshake. As fate would have it, his wife and my mother became best friends in the short period of time that we lived there. Unfortunately, after a year waiting for a congressional investigator to come by, we went back to the Philippines. It wasn’t very long after our departure, that the very neighbors who were part of the petition against our buying the house sent us a letter practically begging us to come back. My father's friends were determined that, one way or the other, they were going to bring us back to America. In 1958, the immigration law changed, and preference was given to people who have technical skills. My father was among the very first group that came in and was hired by an American company. We emigrated in September of 1958. I finished high school in Berkeley. We spoke a mixture of languages at home. My grandmother lived with us, and she could only speak village Cantonese. I learned how to speak Tagalog. I went to an English school, so I grew up in a multilingual environment. It was not uncommon for my dad to say something to me in Chinese and for me to respond in English. For us, it is most important to use words that best describe what we're trying to say, no matter the language. I only applied to one university, and that was Berkeley. I started out in engineering, but that was one of those things that did not work out well. I did very well in math, but I had to work really hard at physics. By the end of the first year, I was on probation. I got my grades back up in the summer. But by the end of the second year, I flunked out. So I went to a community college, got my grades up, and was accepted to the Berkeley Business School. From less than a 2.0 GPA, I was able to get my grades up and get into the Berkeley MBA program, applying again to only one school. After I graduated, I fell into something that seemed natural. I did really well in accounting, so I started working for Haskins & Sells, which became Deloitte & Touche. I didn't realize that even at the age of ten, I was heavily influenced by a gentleman named Washington Sycip in the Philippines. 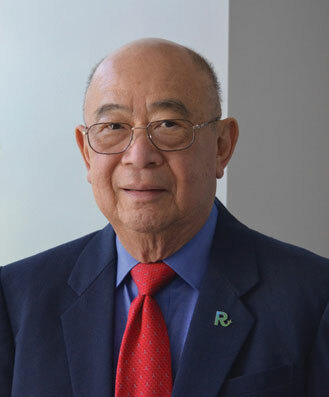 He's a Chinese American who started a highly successful accounting firm in the Philippines. I loved my work and thirty-seven years later, I wasn't ready to retire, so I founded my current accounting firm WuHoover. I promised myself that I was going to give back to America. I saw the good things that my father did and how that benefited us being able to immigrate. So I got very involved in the community, promoting a dialogue, promoting better understanding and protecting freedom. I'm very involved in the Committee of 100 that was created right about the time of Tiananmen Square. Some well-known people came up with the idea for this organization bringing together Americans of Chinese heritage who are renowned in their respected fields to promote better understanding between the United States and China and promoting full participation of all Chinese Americans in American society. This has become an important part of what I am about today. I also want to encourage Chinese students to tutor underperforming kids of other racial minorities. I’m talking about kindergarten, pre-k, and working with those kids to develop a love and a thirst for knowledge. Being an American for me is about the equal opportunities; at least, that's what we fight for. In a lot of countries, it doesn't matter how smart you are, how hard you work, you just cannot become successful if you don't come from the right family. One of the things I love is the fact that we invest in allowing artists to create what they want to create. In a lot of countries, you can't do that. You can't speak your mind. I tell young people that it's okay to fail. What's important is whether or not you can pick yourself up. I think, one of the things I'm proud of is the fact that I flunked out of Berkeley, but I was able to get myself back in within a few months. And I not only graduated, but I got a MBA. And when I look at what I've been able to accomplish since then, I think that had I not failed at twenty years old, I probably would not be the person I am today. It's okay to fail. What's important is what you do about it. I've been asked when did I feel like I was an American? You know, my earliest recollection was a three-year-old in 1945 seeing American tanks roll in to Manila. I guess I always felt like I was American since then. And we were very lucky that we were able to come home to America.